I tried many things as a kid - dance, soccer, Girl Scouts, flute, altar-serving, just to name those I can remember. Most didn't last for long, probably because there wasn't anything I enjoyed quite as much as reading books. So, it's very ironic that now I'm the leader of a little Girl Scout troop. 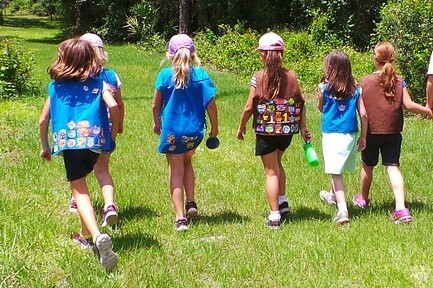 The Girl Scouts have a terrific program for fellow non-profits so they can have their own special closed troops. I connected with them about doing activities with our after-school girls and then it evolved into a troop. And then somehow I became the troop leader. An advice often given to women who have left religious life is "Take up something new and different after you leave community". I just wasn't expecting this one. Not my troop. But you get the point. As much as I fumble through it with the help of another troop leader, this really is the perfect group of girls for me. Our girls aren't your stereotypical middle-class vanilla troop. Out of the stories I know, three girls are cases with Child Protective Services, two girls are former foster-kids that were adopted last year, one girl has a father in jail, and almost all of the girls live in poverty, their afterschool care paid for by childcare subsidies. Their transition and raggedness mirrors my own. But it's Tatiana (not her real name), who I specifically want to focus on. We have only a few girls that are not Daisies (the littlest of the Girl Scouts) and Tatiana is one of them. And if I had to pick one of my favorites, Tatiana would be one of them. It's not because she's one of the most well-behaved...because she's not. In fact, the teachers are frustrated with her, searching endlessly for what might actually make Tatiana happy. At first, I thought this attachment to Tatiana was because she reminded me so much of another girl I knew about ten years ago - a girl that was in my dorm in the hogar in Bolivia, a girl whose hard shell I wish I could have cracked, a girl I wish I would have treated better. But as time passed, I realized that it wasn't just that. It was because I saw myself in Tatiana. I saw the anger. I saw the unhappiness. I saw the brokenness. I saw that it's still not okay. See, Tatiana's mom is also my client, so I knew her story perhaps better than the teachers did. Tatiana's mom struggles to pay the bills and when her boyfriend, the only dad Tatiana knew, was arrested and put in jail, it was devastating both financially and emotionally for the family. Tatiana was already a rebellious girl but that was the tipping point. While Tatiana's little brother was a bit more of a blabbermouth, Tatiana herself was tight-lipped. And if you asked her about her situation, she probably would have said "Why would I care about that?" In Tatiana, I saw everything I was feeling - but kept hidden - played out in front of me. Every time she disrespected authority (which was often), I thought of the times I wanted to do the same when I disagreed with a decision but didn't. Every time I caught of a glimpse of her brokenness, I thought of my own. Maybe you're reading this and thinking "um, I don't think her behavior is the way a Girl Scout should act". And you're right. But, at the same time, I see qualities in Tatiana that were exactly what a Girl Scout should be. I've seen her open doors for others without being prompted. I've seen her smile. I've seen her cry when the same things that she's complained about are taken away. I've seen her progress, each step as slow as a snail, but still. Seeing that little progress in her gives me hope for mine. Tatiana is the type of girl I see that would make the world a better place, truly living out the Girl Scout Law I'm slowly memorizing. Because Tatiana is strong. Because Tatiana is honest (maybe too much) with herself and her feelings. Because I truly believe that one day, Tatiana will heal and use that healing to help others.